Background : The diameter of the aortic root is used as a parameter to calculate blood flow in very preterm infants. There are considerable differences in diameter of the four anatomical landmarks of the aortic root in children and adults, but limited data are available for the very preterm population. The aim of this study was to obtain reference and reliability data on two-dimensional measurements of the aortic root in very preterm infants <30 weeks gestation. Materials and Methods : Fifty long axis echocardiograms were reviewed and re-analyzed for measurements at the four anatomical landmarks of the aortic root; the aortic annulus, sinus of Valsalva (SV), sinotubular junction, and the proximal ascending aorta (PAA). A subjective visual scoring system was developed to quantify image quality. A random sample of images was blindly re-measured to assess intra- and inter-observer reliability. Results : Significant differences in diameter were found between the four landmarks, except between SV and PAA. Inter-observer coefficients showed marginal variation ranging from 5.0% to 8.2%, with slightly lower intra-observer variability. Overall image quality score was poorest for PAA on standard long axis images but improved when the probe was adjusted along the outflow tract. Conclusion : We present reliability and reference values for all four anatomic landmarks of the aortic root in very preterm infants and demonstrated the importance of standardizing and reporting cardiac output measurements in preterm infants. Accurate assessment of the circulatory function in the preterm infant has the ability to improve patient care. Doppler ultrasound measurements of blood flow can offer an understanding of the pathophysiology underlying common clinical presentations and can help to guide treatment choices. However, variability of blood flow measurements has been reported to be as high as 22%, with inter-observer variability even higher. , Vessel diameter, velocity time integral (Vti), heart rate, and body weight are the determinants of blood flow calculations, and the main cause of variability is found in the diameter measurements. Reducing this variability in diameter measurements could strengthen the role of blood flow measurements in clinical practice. When reviewing the current methodology of measuring blood flow, a large variety is found. This is, especially true for left ventricular output (LVO), where variation is found for both Vti measurements and diameter measurements. ,,,, The aortic root diameter was often measured in M-mode, currently no longer recommended. Although superior in temporal resolution, M-mode measurements are susceptible to error. The M-mode beam has to be placed perpendicular to the vessel wall to produce accurate results, and this is not always possible. Furthermore, M-mode measurements of the aortic root do not prespecify what area is actually measured and used for calculation of LVO. The aortic root is an area stretching from the aortic annulus (AA) to the proximal ascending aorta (PAA), including the sinus of Valsalva (SV) and the sinotubular junction (STJ) [Figure 1]. There are considerable differences in diameter of the AA and SV in children and adults, but limited data are available for the preterm population. , The aim of this study was to obtain reference and reliability data on two-dimensional (2D) measurements of the four landmarks of the aortic root in very preterm infants. The study population consisted of infants admitted to the John Hunter Hospital Neonatal Intensive Care Unit, Newcastle, Australia. Following ethics approval from the Hunter New England Human Research Ethics Committee, long axis ultrasound images of the aortic root obtained for clinical purposes and stored on the local server were retrospectively explored. The images were acquired using a Philips iE33 ultrasound machine with 12.5 MHz probe and performed by one investigator (KW). Images of stable preterm infants <30 week gestational age with a structural normal heart with or without the presence of a patent ductus arteriosus (PDA) or open foramen ovale were included. The images were analyzed according to a predefined protocol. A subjective visual scoring system was developed to quantify image quality and score clarity of the anterior and posterior hinge points, walls, and distinct anatomical reference points. 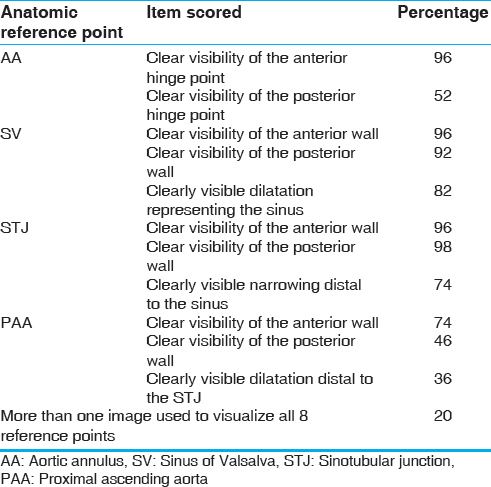 Clear visualization of each of the landmark reference points [Table 1] of the aortic root was scored as yes or no, and a maximum score of 12 could be obtained. Images were measured using the inner diameter (inner edge to inner edge) at the four anatomical landmarks of the aortic root; the AA, SV, STJ, and the PAA. The mean of three diameter measurements for both the maximum and minimum diameter for each anatomical point was recorded. We estimated a sample of 50 scans that would be sufficient to provide initial reference values. The difference in diameter between the four anatomical landmarks was assessed with t-tests, and linear regression was used to explore relationships between diameters and weight. A sample of 8 (16%) scans was blindly re-measured by both investigators to establish reliability data. To assess intra- and inter-observer reliability a Bland-Altman approach was used to calculate bias and limits of agreement. The coefficient of variation (COV) (the standard deviation of the difference of the two samples divided by the average of the two samples) was also calculated. Fifty scans in 48 stable preterm infants were included in the analysis. The median gestational age was 27 weeks (range 24-29) with a birth weight of 1000 g (range 560-1670). Most scans (86%) were performed while the infants were on nasal continuous positive airways pressure, and four scans when on mechanical ventilation for respiratory distress syndrome. The median FiO 2 and mean airway pressure was 21% (range 21-35) and 6 cm H 2 O (range 0-8), respectively. Twenty infants had a PDA >1.5 mm and 31 a foramen ovale >2.0 mm at the time of the scan. Image quality of the included images is presented in [Table 1]. The exact position of the posterior hinge point of the aortic valve was only clearly visible in just over half the images. The anterior and posterior wall of the SV and STJ could be easily visualized, but distinct anatomical features were not always present. The PAA scored lowest overall. In 10 scans, the PAA could not be analyzed from the same image where AV, SV, and STJ were analyzed. The maximum and minimum diameters for each anatomical point are presented in [Table 2]. Significant differences were found between the four landmark diameters, except between SV and PAA (paired sample t-test P < 0.001). All diameters increased with weight at time of measurement (r 2 = 0.23-0.43, P < 0.001). The intra- and inter-observer variability are presented in [Table 3]. Inter-observer COV ranged from 5.0% to 8.2%, with slightly lower intra-observer variability. Maximal SV diameters showed the lowest COV, and minimum AA diameter the highest, but the difference was marginal and probably not of clinical importance. This study provides reliability and reference values for aortic root dimensions using 2D parasternal long axis echocardiography for infants <30 weeks gestational age. Reliable and accurate cardiac output measurements are essential for the hemodynamic assessment of sick newborns. Small variations in diameter, especially in this specific population of very small size, can have a large impact on the cardiac output as the diameter is squared in the formula to calculate cardiac output. Our data show that using an aortic root diameter needs further specification on where exactly is measured, as diameters between the four anatomical landmarks varied significantly and the differences were large enough to be of clinical importance. The marginal differences in variability found between the four landmarks indicate that there is no "preferred" diameter. Each landmark had its own advantages and limitations. The exact position of the posterior hinge point of the annulus could not frequently be determined, but we feel this does not influence annulus diameter measurement as the valve was merely positioned flat against the wall. The PAA was best visualized with alternative image acquisition compared to the conventional long axis view. 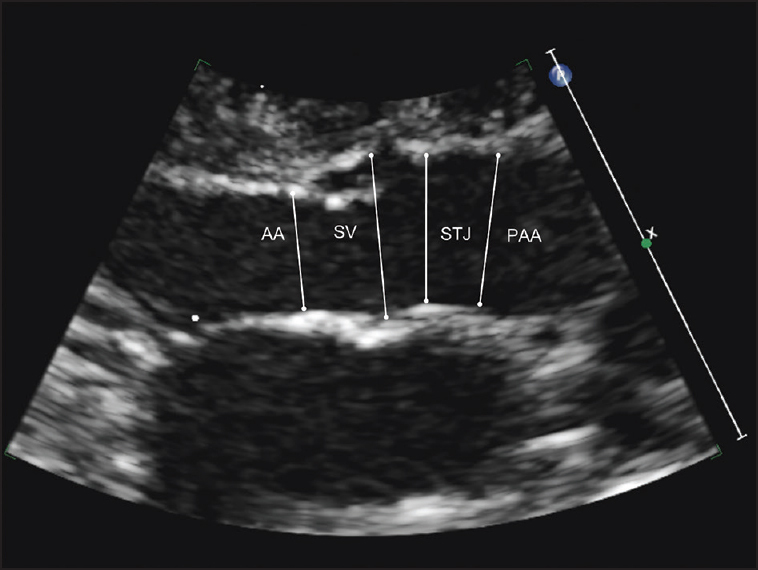 Movement of the probe slightly upward along the ascending aorta could best visualize the PAA. From a physiological point of view, it would be most appropriate to measure the smallest diameter before the sinus for true LVO, or the smallest diameter after the sinus to represent blood flow to the body minus coronary blood flow. We cannot comment on which parameter is the most accurate, as no gold standard for LVO was used in this study. Mellander et al. compared echocardiography and thermodilution LVO measurements in infants and children and found the internal diameter of the AA as most accurate. Ficial et al. studied the validity of systemic blood flow measurements in 49 preterm infants with magnetic resonance imaging (MRI) as alternative imaging mode. Echocardiographic assessment of calculated LVO showed a strong correlation with MRI assessment. However, the Doppler measurements took place at the AA and the MRI measurements at the SV. The lower diameters with echocardiography were compensated by higher Vti to produce comparable LVO, but the study does not provide evidence on what area of the aortic root is most accurate. For optimal cardiac output measurements, the pulsed Doppler sample volume has to be placed exactly at the same level where the diameter was measured. There are minimal published data on aortic root diameters in very preterm infants. We previously reported on 2D measurements of the PAA in a large cohort of very preterm infants. Other existing data were obtained by M-mode and mean diameters varied between 5.3 and 7.3 mm in the population under 1500 g. ,, As mentioned, M-mode measurements do not specify what area is measured. If the recommendations by Sahn are followed, then is it likely that the widest area at the SV was measured. Current recommendations for measurements of the aortic root refer to 2D measurements at the SV, with separate measures described for the AA, STJ, and PAA. Beker et al. found that estimation of LVO with diameter measurement at the STJ is more precise and accurate than measurement at the AV or the AS, when compared to right ventricular output (RVO) in preterm infants. The study compared a calculated LVO using heart rate, Vti, and diameter, to predict RVO assuming a LVO: RVO ratio of 1. Infants with minimal shunt over a PDA and/or foramen ovale were included in the study, making interpretation difficult. Vti measurements usually have low measurement variability, but the presence of a small PDA can produce turbulent blood flow in the right ventricular outflow tract obscuring the borders of the Doppler blood flow velocity trace. Even a small open foramen ovale can alter the LVO: RVO ratio up to 50%. Both this study and ours demonstrate the importance of correctly standardizing and reporting LVO measurements in preterm infants. We present reliability and reference values for all four anatomic landmarks of the aortic root. The SV had the highest image quality score, closely followed by STJ. Differences in measurement variability between the landmarks were marginal. The data are limited by the relative small sample size but can help strengthen the role of blood flow measurements in clinical practice. de Waal K, Kluckow M. Functional echocardiography; from physiology to treatment. Early Hum Dev 2010;86:149-54. Chew MS, Poelaert J. Accuracy and repeatability of pediatric cardiac output measurement using Doppler: 20-year review of the literature. Intensive Care Med 2003;29:1889-94. Tsai-Goodman B, Martin RP, Marlow N, Skinner JR. The repeatability of echocardiographic determination of right ventricular output in the newborn. Cardiol Young 2001;11:188-94.
de Waal K, Kluckow M, Evans N. Weight corrected percentiles for blood vessel diameters used in flow measurements in preterm infants. Early Hum Dev 2013;89:939-42. Alverson DC, Eldridge MW, Johnson JD, Aldrich M, Angelus P, Berman W Jr. Noninvasive measurement of cardiac output in healthy preterm and term newborn infants. Am J Perinatol 1984;1:148-51. Walther FJ, Siassi B, Ramadan NA, Ananda AK, Wu PY. Pulsed Doppler determinations of cardiac output in neonates: Normal standards for clinical use. Pediatrics 1985;76:829-33. Mellander M, Sabel KG, Caidahl K, Solymar L, Eriksson B. Doppler determination of cardiac output in infants and children: Comparison with simultaneous thermodilution. Pediatr Cardiol 1987;8:241-6. Mandelbaum-Isken VH, Linderkamp O. Cardiac output by pulsed Doppler in neonates using the apical window. Pediatr Cardiol 1991;12:13-6. Evans N, Kluckow M. Early determinants of right and left ventricular output in ventilated preterm infants. Arch Dis Child Fetal Neonatal Ed 1996;74:F88-94. Lopez L, Colan SD, Frommelt PC, Ensing GJ, Kendall K, Younoszai AK, et al. Recommendations for quantification methods during the performance of a pediatric echocardiogram: A report from the Pediatric Measurements Writing Group of the American Society of Echocardiography Pediatric and Congenital Heart Disease Council. J Am Soc Echocardiogr 2010;23:465-95. Roman MJ, Devereux RB, Kramer-Fox R, O′Loughlin J. Two-dimensional echocardiographic aortic root dimensions in normal children and adults. Am J Cardiol 1989;64:507-12. Sheil ML, Jenkins O, Sholler GF. Echocardiographic assessment of aortic root dimensions in normal children based on measurement of a new ratio of aortic size independent of growth. Am J Cardiol 1995;75:711-5. Ficial B, Finnemore AE, Cox DJ, Broadhouse KM, Price AN, Durighel G, et al. Validation study of the accuracy of echocardiographic measurements of systemic blood flow volume in newborn infants. J Am Soc Echocardiogr 2013;26:1365-71. Reller MD, Meyer RA, Kaplan S. Normal aortic root dimensions in premature infants. J Clin Ultrasound 1983;11:203-5. Skelton R, Gill AB, Parsons JM. Reference ranges for cardiac dimensions and blood flow velocity in preterm infants. Heart 1998;80:281-5. Sahn DJ, DeMaria A, Kisslo J, Weyman A. Recommendations regarding quantitation in M-mode echocardiography: Results of a survey of echocardiographic measurements. Circulation 1978;58:1072-83. Beker F, Davis P, Sehgal A, Rogerson S. Echocardiographic assessment of left ventricular outflow tract diameter in preterm infants. Australasian J Ultrasound Med 2014;17:146-49. Evans N, Iyer P. Incompetence of the foramen ovale in preterm infants supported by mechanical ventilation. J Pediatr 1994;125:786-92.